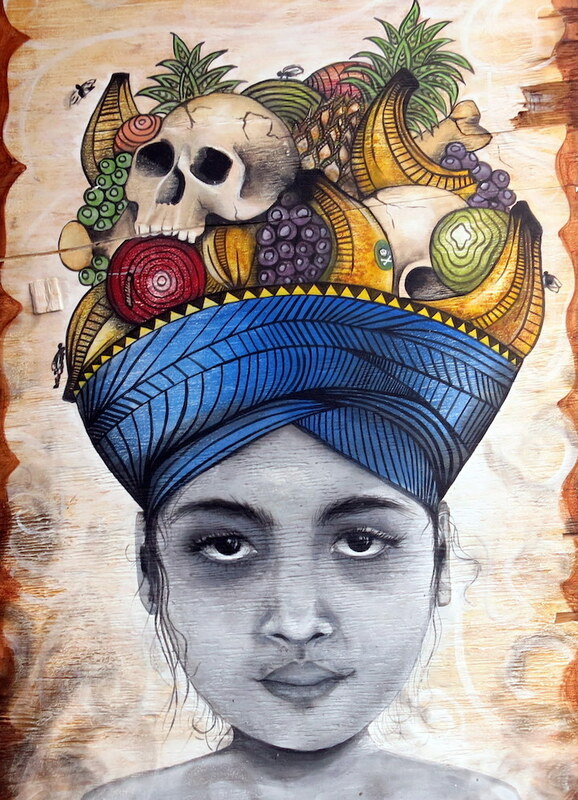 A collective of artists based primarily in Harlem, HART has become an active force in the uptown arts scene. While visiting its space, I had the opportunity to speak to one of its founders, Kristy McCarthy aka D Gale. Can you tell us something about HART’s mission? 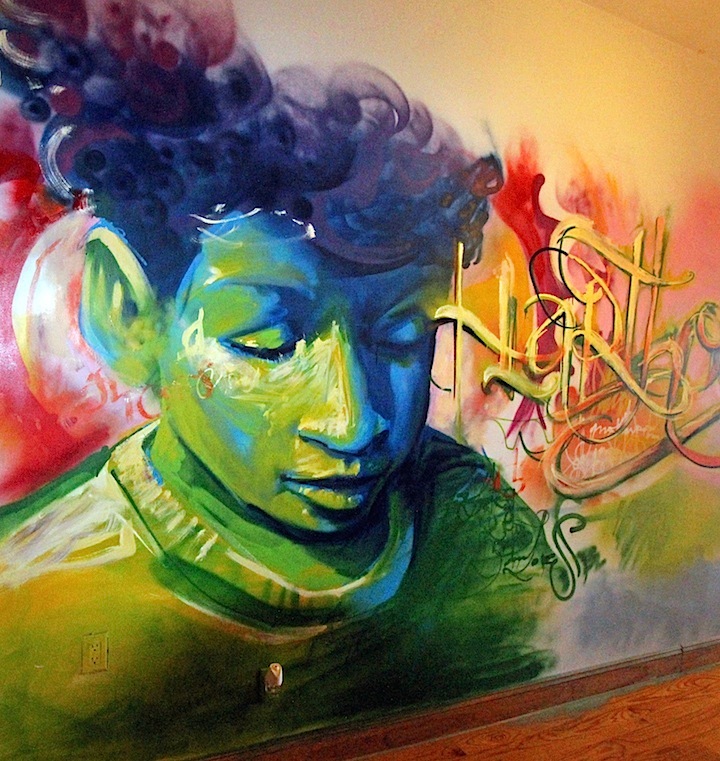 Our mission is to use art as a tool to engage, educate and empower the members of our Harlem community. We are especially interested in beautifying abandoned and neglected spaces. 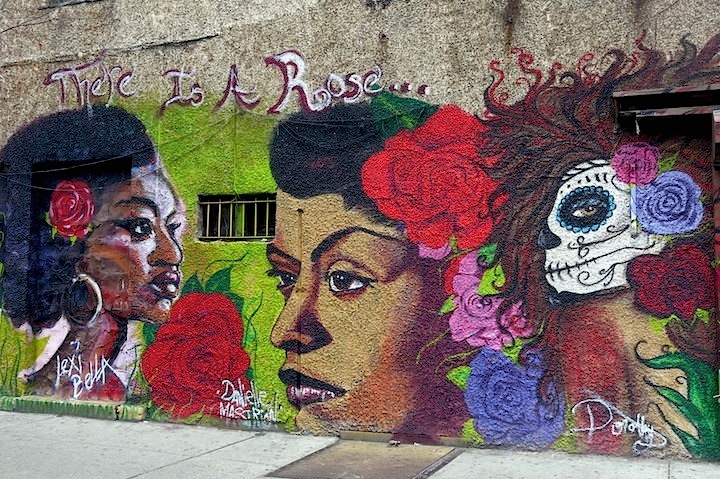 When was the Harlem Art Collective first born? And was anyone – besides you – involved in its conception? It officially began last February. Gia Gutierrez and I had talked about starting some sort of Harlem-based artist organization. But as she didn’t have enough free time at that point to devote to launching it, Harold Baines and I organized the first few meetings with about 10 other artists and community members. How did you get the word out? And how many artists are currently involved? We initially got the word out mostly via emails and through our personal networks. About 40 artists currently participate. Here at HART’s base, you provide space for local artists to live and free studio space for artists to create. In addition, you rent out two of the bedrooms to folks who are in NYC for short periods of time. How did you come upon such an amazing 5-bedroom space in the heart of East Harlem? We found out about it from the building’s landlord. And its size and location made it a perfect match for our needs. 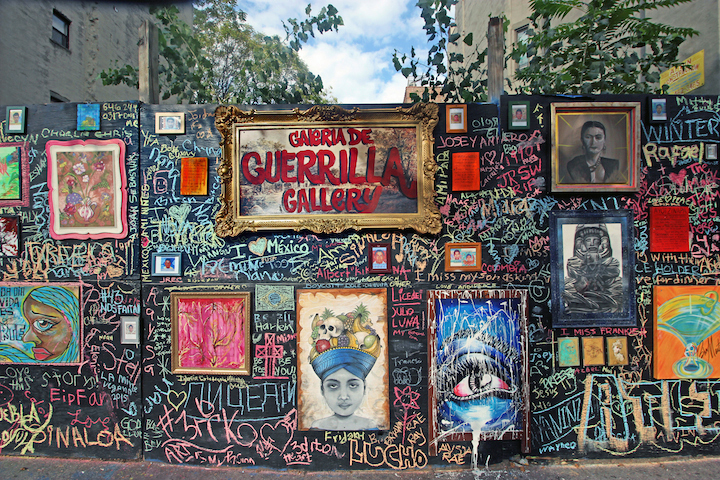 Among your projects is the always-engaging Guerilla Gallery on 116th Street off 2nd Avenue. It has introduced us to many new artists, and it also showcases art by some of our all-time favorite ones. What other projects have you initiated? 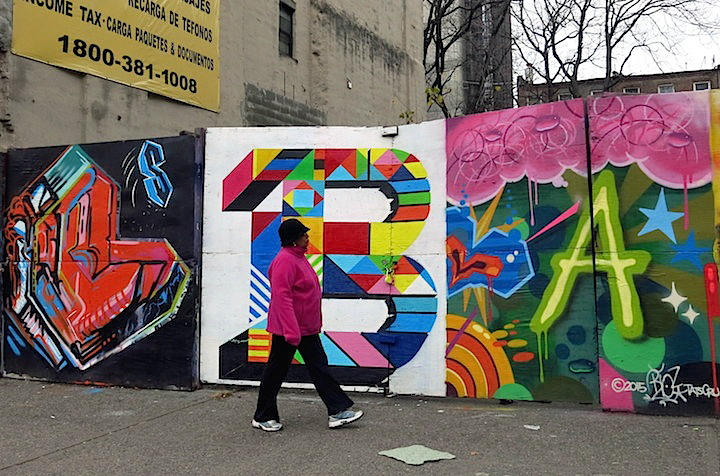 We have partnered with other community organizations — such as the East Harlem Block Nursery, Concrete Safaris and the Manatí Community Garden — to paint murals at block parties and community events. We worked with Urban Innovations to paint and install little free libraries in community gardens around Harlem, and we have hosted free art workshops at the HART house. How can an artist join your collective? We hold meetings twice a month. Anyone interested in attending and finding out more about HART can contact us via our Facebook page. We are also going to start a monthly newsletter this spring and, hopefully, add a community calendar to the Guerilla Gallery. We are working on organizing a spring show that will feature artists from the collective and from the neighborhood. We are also working on starting other Guerrilla Galleries on abandoned construction walls around Harlem. And we are planning to paint more murals that directly involve the community. We have, also, recently formed a women’s caucus within the collective to organize projects specifically dedicated to women’s issues and female empowerment. That sounds great! Good luck with it all. We are looking forward! We love community art, but not at the expense of our community. Please don’t use quaint (misleading) descriptions of HART’s gentrifying business practices. Renting rooms to foreign tourists through AIRbnb has been proven to cause a ripple effect on local rents. I can’t pretend to understand the politics of East Harlem. But I don’t understand how you can refer to a group of artists renting out affordable spaces while trying to support themselves as gentrifiers. The onus — I would think — is on the developers. First, their rents are not “affordable.” Renting to foreign tourists reduces the number of apartments available to local residents and encourages surrounding landlords to do the same. Hence: gentrification. The apartment where the HART house is located was empty for years before it was occupied by a European modelling agency in 2013. They defaulted on their rent and were evicted in 2015. Technically, anyone paying market rate rent for an apartment is gentrifying the neighborhood, whether they airbnb or not. You didn’t seem to mind the Harlem art collective’s so-called business practices when you included the guerrilla gallery as a stop on your walking tour, which you were offering to… Tourists. For $10/head. Furthermore, we are currently only renting one room on airbnb, and that is only to offset the rent for the other four local artists that live there. While we do recognize the negative impact that airbnb can have when abused, we also feel that it can have a positive impact when used for the right reasons. There is a huge difference between a landlord emptying out a unit to convert it into a for-profit illegal airbnb hostel, and a group of local artists renting out rooms in the apartment that they live in so that they can afford to stay in their neighborhood. As I’ve offered before, we are always open to, and have even attempted to facilitate (but were rejected), an educational discussion about displacement and gentrification. Rather than constantly criticize us publicly on social media, why not do something constructive with us ? Wow, Kristy has a lazer-sharp aim, and the educated mind to deliver a knock-out punch in a single sentence!!! !